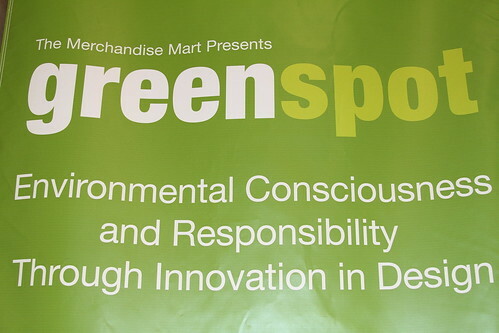 What do elephants, flooring and green have in common? Lots when it's NeoCon 2010! 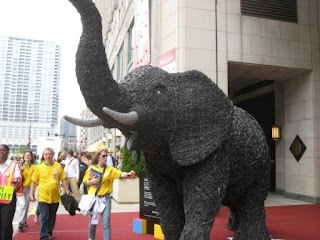 Instead of the elephant being in the room, it was standing outside of the Merchandise Mart in Chicago this past week at NeoCon. The elephant was brought to you courtesy of Interface Flors who summoned artist Andrias Botha of the Human Elephant Foundation to display his life size mammal sculpture made out of recycled truck tires. This display was a clearly an extension of Interface Flor's company message to achieve a zero carbon foot print by 2020 and was seen by the 40,000 attendees that were projected for this 3 day event. Green was certainly a stand out feature among exhibitors at this year’s event but equally as impressive is the 4.2 million square foot Merchandise Mart which is the world’s largest commercial building that has received a LEED-EB Silver Certification from the US Green Building Council. Neocon not only encompasses commercial furnishings such as chairs, tables and wall coverings but also on display are the various floor covering options that are available in the commercial sector. Notable displays came from US Floors, Milliken and Shaw Contract Group who won the Modular (Tile) Silver Award for their 18x36 product. The Mohawk Group who cleverly added a photo booth to their display where attendees can take away a snap shot of themselves along with the company’s My Solution product line. The mood at NeoCon seemed hopeful and positive as the commercial interiors industry slowly starts to recover from the economic hardship of this past year. Exhibitors hosted show room parties on the first day and industry associations such as the International Interior Design Association (IIDA) hosted their annual gala. 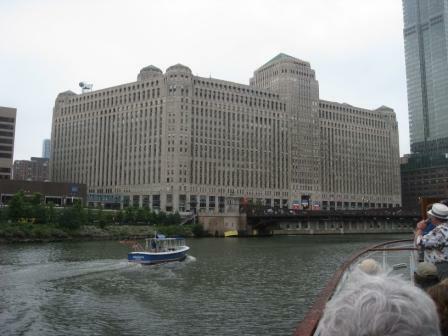 Other networking and social events such as cocktail receptions were held at various sites around the city of Chicago. All in all, a good looking event and a great experience. If you were there, what did you find most interesting? NeoCon 2010 - 6.15.10 greenspot 003 originally uploaded by The HON Company.